Posted October 24, 2014 by admin & filed under Events. 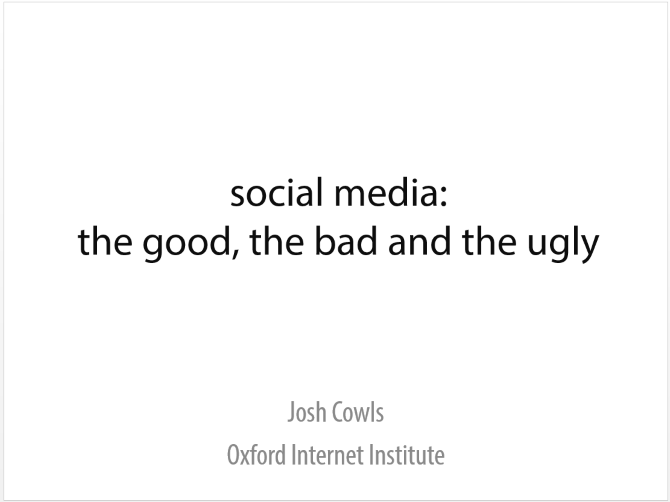 Josh Cowls, a researcher from the Oxford Internet Institute looked at the pros and cons of social media, and some of the challenges associated with the technology, from a non-technical perspective. If you believe the hype, it has brought down dictators, rescued thousands in natural disasters, and even solved crimes. However although there have been revolutionary impacts in many, there is reason for caution. The internet is an information AND communications technology, and social media platforms are just the latest technology to exploit this infrastructure. The technology is neutral, and does not discriminate. However it provides a good way of collecting and diffusing information; for example aiding in emergency situations. Used in this way it can be extremely positive. However where information is more mediated, human frailties can be amplified in an anti-social way, and inequalities can replicate. The examples of Internet trolls, and teh “dark net” are examples where the more negative sides of human nature can amplified by the capabilities of social media. It is also possible to use social media to measure public opinion, particularly as the cost of data acquisition does not scale as the number of participants. However there are still issues to resolve, such as representativeness, reliability of results, and replicability. For example the density of tweets during Hurricane Sandy did not represent the areas hardest hit. Therefore like all new technologies we must use it well, and as a force for good, while recognising there is also converse opportunities.